I must admit, as a reader, I find the television show “Downton Abbey” quite frustrating at times. I am a reader first and foremost, which means I’m used to setting my own tempo on how fast I read a story; and I can’t do that with a fixed TV series’ schedule. Like other anxious fans, I have to patiently wait for each episode while restraining myself from checking various spoilers. If you’re as impatient as I am, you might enjoy my suggestions to get a similar “fix” between episodes, which feature my favorite Downton Abbey elements. Firstly, I love the humor so you are sure to let out a few chuckles reading An Evening of Long Goodbyes by Paul Murray. If you enjoy the “upstairs, downstairs” class portrayals in, I would suggest the 1968 memoir Below Stairs by Margaret Powell, which recounts 10 years of her service in a noble house. The story starts in the 1920s and although the house is not quite as grand as the Downton Abbey, the “downstairs” politics factor just as much. Also falling under this category is the Booker-winning novel The Remains of the Day by Kazuo Ishiguro. It’s a subtle, beautiful and thoughtful portrait of dignity, love, and the class divide. Ambiguous entanglements, English nobility, and a big, gothic house? Brideshead Revisited by Evelyn Waugh has it all. British officer, Charles Ryde, recounts his time spent with the aristocratic, religiously superficial, and strangely charismatic Flyte family. 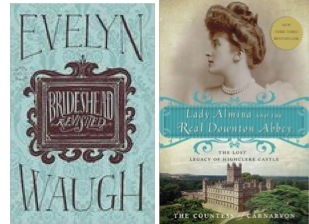 If it’s only Downton Abbey that can charm you, check out Lady Almina and the Story of the Real DowntonAbbey. This book examines Highclere Castle, the real-life inspiration for program and the life of one of its most famous inhabitants, Lady Almina, the 5th Countess of Carnarvon and the basis for the fictional character Lady Cora Crawley. 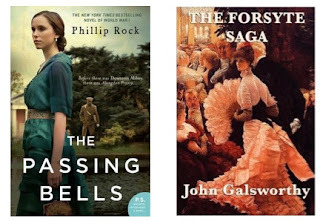 For those of you who love sagas check out Phillip Rock’s The Passing Bells, a trilogy, recently re-published by HarperCollins. You will probably also enjoy The Forsyte Saga by the Nobel prize-winning John Galsworthy. This witty and satirical story depicts the trials and tribulations of a noble family who cannot fathom the idea of adapting to the modern world. If you’re keen to read more classics from this period, I could not say enough great things about E.M. Forster, Howard’s End or A Room with a View. You are sure to love the way Forster tackles the rigidity of class and property that made human connection so difficult during this era, particularly for women. For those who fancy a love story set during World War I, you simply MUST read Birdsong by Sebastian Faulks. This is a powerful description of the human cost of trench and tunnel warfare in the First World War, mixed with a heart breaking love story. 3. Once you are viewing the list, you can then easily add all of these titles to your bookshelf, wish list, or maybe even your 2013 reading list. … and don’t forget to add the “For Downton Abbey Fans” tag to any of the books that you have read and that have satisfied your hunger for that irresistible Edwardian charm.